As we all know, most animals aren’t really capable of holding grudges, but I know at least one goat who is excellent at it. Mudslide was already an adult when I came to the dairy, one of the only goats sporting a set of full horns. The story went that as a baby, she was mistaken for a buckling, and by the time it was discovered, her horns were too well grown to disbud, so she kept them. While some folks prefer horns on their goats, we are decidedly anti-horn for a multitude of reasons, and when Mudslide broke the hip of another goat, a decision had to be made. Sell her, or remove her horns. Now, I have removed the horns on several adult goats. It’s usually done using the same bands one would use the castrate male goats, placed around the base of the horn and left to slowly constrict and stop blood flow to the horn, until it finally comes loose. It’s an unpleasant way of doing things, I would much rather disbud a kid than band an adult’s horns, but sometimes it must be done. Surgery to remove horns can be done, but is unfortunately quite risky as goats do not handle anesthesia very well. The last goat I’d done was a nice little Pygmy mix who made it through the procedure with flying colors, leaving a nice head. Not so successful was a big Nubian mix, who I did too early – the horns continued to grow, and though one came off perfectly, the second left quite an impressive knob that stands on her head to this day. I keep telling myself to take it off, but it’s one of those chores that gets pushed back over and over again. However, horns are truly a ticking time bomb – I’ve learned that lesson over and over. When another doe with horns got herself caught up when out browsing, I knew it was time to decide. Mudslide was queen of the herd at the time – those thick horns gave her an advantage none of the other goats could hope to match. I’ll never forget how Mudslide would stand at the dairy door with a several foot radius around her – no other goat dared to go in until Mudslide had, and she guarded her privilege fiercely. I knew from experience that taking away her horns would change her entire perspective, and I was regretful of that, but it had to be done. As much as I dislike to do it, I’ve yet to regret removing a goat’s horns – but I have regretted more than once not doing so. So when the day came, I put Mudslide on the milkstand and I carefully put the bands around the base of her horns, wrapping them with tape afterward to protect it. Within hours, you could tell she was uncomfortable, and as the days went by, I watched her position slip further and further as she could no longer use her horns to be an aggressor. However the banding went as perfectly as one could hope for – slower is better, as there is a hole that leads to the sinus cavity beneath the horn, and it needs time to heal over before the horn comes off. Eventually they dropped from her head within days of each other. I found the first horn in the barn, and the second one of the dogs brought to the house, where I confiscated it. Mudslide no doubt had a terrible headache and her position remained low for several weeks, as to be expected. What I didn’t expect was her change in attitude towards me. Mudslide has always been a very friendly doe with people and never had any issues being caught or handled. But after I banded her horns, I could no longer touch her. While others could pat her, Mudslide shied away from my hands. She’d kick at me on the milkstand, stamping her hind feet in protest if I was milking. Catching her for any reason meant a chase, and she’d squirm and complain once I’d caught her. More than once I’d catch her glaring at me from a distance, warily watching my every move. 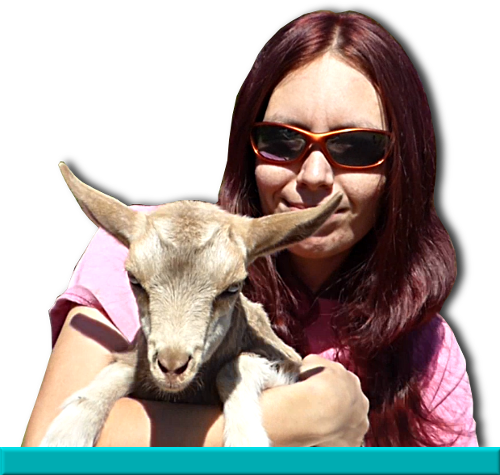 Where every other goat had quickly forgotten and forgiven, Mudslide knew I had caused this discomfort. She knew I was responsible not just for the loss of her coveted horns, but her loss in position. I’d never seen a goat hold such a grudge before. As her head healed, Mudslide’s attitude healed with it. Before long she was fighting her way back to the top, and the other goats clearly remembered her reign of terror and gave way. Soon enough she was top of the Mini Manchas once more, where she still remains. But she hasn’t forgotten. Years later we have a decent relationship, after lots of work and treats. I’m allowed to touch her nose or milk her without troubles, but I can always see that glint of distrust as she moves out of my reach anytime she thinks I want to catch her. I regret this distance between us, but I don’t regret what I did – the few goats with horns that were left on the farm are gone now, as Mudslide would have been if I didn’t remove her weapons. I’d rather have a grumpy Mudslide than no Mudslide at all. Both of her horns are still on my desk to this day, a reminder of what a warrior she once was. For the rest of my life I’ll remember the goat that was smart enough to connect me to what she went through; the goat who held a grudge.